What constituted “work of national importance”? Selective Service, in consultation with the National Service Board of Religious Objectors (NSBRO), approved the type of work determined by the various government agencies to be “work of national importance” due to labor shortage during the war. Of the 67 base camps, 30 were operated by the Forest Service and 19 by Soil Conservation Service. Table from Camp Operations Division, Selective Service Headquarters May 15, 1941 through March 31, 1947. What were the types of camps or units in which COs served? Selective Service approved each camp or unit aided by the National Service Board of Religious Objectors (NSBRO); a government technical agency supervised that work; and church related operating agencies oversaw the men, who served without pay in the more than 150 camps and units. COs first reported to Base Camps, for the most part housed in converted Civilian Conservation Corps Camps, located in isolated places. There they received orientation to the particular “work of national importance” by the government technical agency, induction into CPS by the church operating agency including orientation for living together in a pacifist community, time for spiritual and personal development, and introduction to camp governance. After time spent in base camps, many men opted to perform Detached Service, where they volunteered for special project work in units within public health, state mental hospitals, state training schools, dairy testing or other farm work, smoke jumping, government research, human guinea pig research, or with the National Service Board for Religious Objectors (NSBRO) and related agencies on relief and other projects. This website also describes the Seagoing Cowboys project, not a camp, not part of CPS, but utilizing a CPS Reserve Corps to tend livestock on ships sent to war ravaged countries during 1946 after hostilities had ended. A three-layered administrative structure appeared: 1. Selective Service, an agency which came under the direction of army officers; 2. the National Service Board for Religious Objectors (NSBRO)1, a majority of the members from the Peace Churches; 3. church operating agencies, principally the American Friends Service Committee (AFSC), Brethren Service Committee (BSC) and Mennonite Central Committee (MCC)2. Although the lines of authority were at times blurred, Deputy Director Colonel Kosch spoke for Selective Service: “The draft is under United States government operation. Conscientious objectors are draftees as soldiers are. Their activities are responsible to the government. The Peace Churches are only camp managers.” This uneasy church-state partnership, with its strains and flaws, survived for seven years. 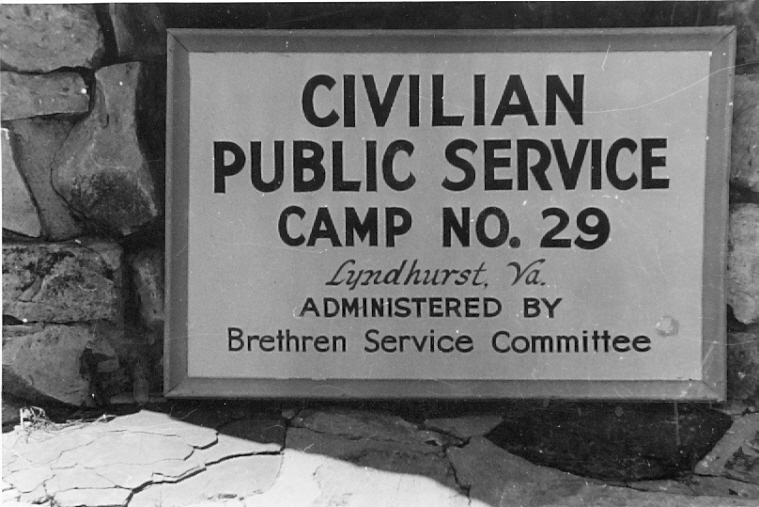 1 The National Service Board for Religious Objectors (NSBRO), a representative body created by Brethren, Friends and Mennonite leaders served as the advocate for Conscientious Objectors (COs), aided Selective Service in selecting camp sites and in identifying alternative service project ideas. 2Other operating agencies included American Baptist Home Mission Society, Association of Catholic Conscientious Objectors, Disciples of Christ, Evangelical and Reformed, Methodist Commission on World Peace, National Service Board for Religious Objectors, Office of Scientific Research and Development, Selective Service System. Each camp and unit is numbered. For each you will find not only its location by city and state or territory, but also any official name, when it opened and closed, the church operating agency, the technical agency, and a description of its work, life and people. Some of the numbered camps and units divide into multiple subunits, which you will find when you click on the main number. As you enter the description, you will find in the left corner of the description, the list of all the men who served there during its life. You can reach a camp by clicking on its number within an individual CO’s record, or you can go directly to the list of camps. The website structure permits you to search by operating agency, technical agency or location.